More people than we realise are in pain every moment of every day. I can quickly name three people I know who struggle with pain on an almost daily basis, but I’m sure in reality a lot more people do. When we’re in pain we usually take medication that we can buy over the counter. It’s only when the pain fails to disappear that we tend to seek medical advice. I have been in chronic pain on and off for the last 3 years, and sometimes I struggle so much that I wonder if I can ever truly say ‘Goodbye’ to the pain that I feel. From my perspective, I know what can help to alleviate the pain. I know that keeping active will fight a lot of my pain, but it probably won’t disappear forever. So how can we say ‘Goodbye’ to pain? How can we show it out the door without having to take mediations that make us feel drowsy? 1 Making sure you stay active is vital as it can help your brain to block pain signals. What’s more is going for a walk, a swim or even doing a bit of gardening can help to stretch your stiff muscles, joints and ligaments. 2 Breathe slowly as this helps you to feel more relaxed an even in control. This can be hard to do at times, but trying to stay relaxed will help to get rid of any tension and anxiety you feel about your pain. 3 Ask for help with your pain, talk to your doctor, a counselor or even a psychologist. Although they may not be able to help you directly, they may help you to deal with the emotions you feel when you’re in pain. 4 Try to think about something else, if you sit there thinking about your pain it’s not going to get better any time soon. Do something you enjoy, and you will start to relax and concentrate on something else. 5 Try to get a good nights’ sleep. I know this can be difficult, and in some cases the pain could keep you awake, but you need to rest. Making sure you get the sleep you need can make your pain a little easier to deal with. 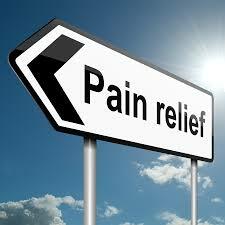 6 Visit pain management centers or undergo courses that can help you to deal with your pain. Some courses on offer will help you to think about your pain in a different way, and ensure you try to concentrate on the positive aspects of your life. Following these tips may just help to make a difference to your pain. If you feel stuck in a rut and you simply cannot get rid of your pain, please speak to your doctor as they may be able to offer your more treatment. Previous Previous post: Can you Quit Smoking without Help? Next Next post: Can You Protect Yourself From Cancer?